A peek at Eddie Ross' apartment per his Instagram account. 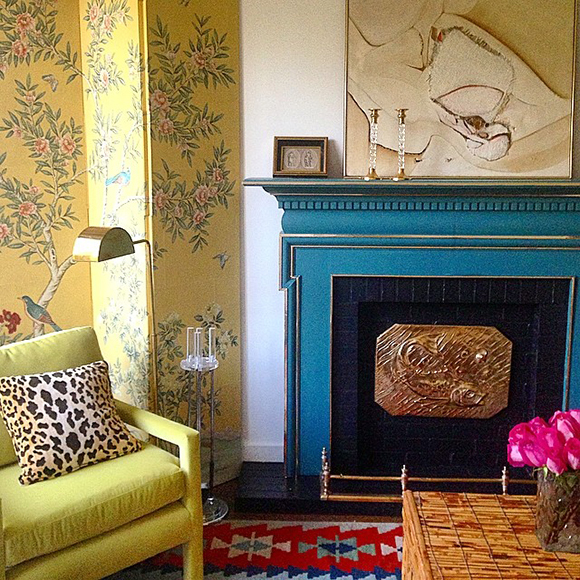 I seriously don't know what element I love most but that peacock fireplace, Chinoiserie screen, chartreuse chair and awesome rug are all contenders. What an amazing vignette - you know his home must be an eye-popper. I believe they are photographing it for Better Homes & Gardens...will keep my eyes peeled for that issue! Hope you have a wonderful weekend! See you next week! The chartreuse chair is rad! Beautifully combined pieces. agreed on that peacock fireplace -it's magnificent. I think the new trend (i'm calling it now) is to move away from boring white trim and start to see some COLOR and more interest. It started timidly with black doors with white trim but I think we're going places with this!